The reaction to Aston Villa’s away defeat to West Ham saw the gloom merchants out in force, with some joining Robbie Savage in predicting relegation for Villa, with some suggesting nothing had changed from last season. I suggest they actually watch the game. While Villa offered very little in the final third, the passing, building-from-the-back approach from Villa was a revelation compared to watching them last season. Now it’s a question of honing it and developing it, especially when it comes to creating chances. Did people expect Paul Lambert to come in, click his fingers, and suddenly Villa would be playing ala carte football ala Barcelona? It will take time and patience is clearly needed. The same goes for signings. With the window over a week away yet, now is not time to panic after just one game (I blame twitter and social media – nobody used to react after one game like this before). Lambert is an astute character with a good knowledge of the European game. The decent valued buys he’s made so far, were off the radar of most Villa fans. That can only be a good sign. We need to be buying clever – like Swansea, Newcastle, Everton – rather than just going after ‘known’ mercenary-waged players, that seem to be the limits of many moaning Villa fan’s knowledge – Defoe, Carroll etc. Regarding losing the first game of the season. 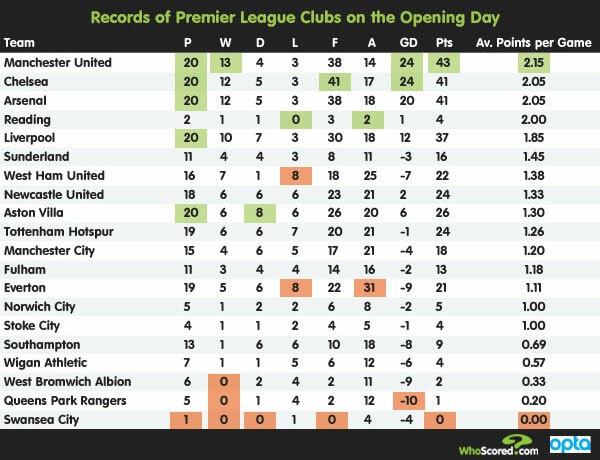 Villa’s normally had very varied success when it comes to the season opener, as this table by whoscored.com shows. Also, O’Neil only won one out of four opening games. When Villa were last the League Champions, they started the following 1981/82 season with a 1-0 home loss against Notts County. It didn’t stop them becoming the Champions of Europe by the season’s end though. 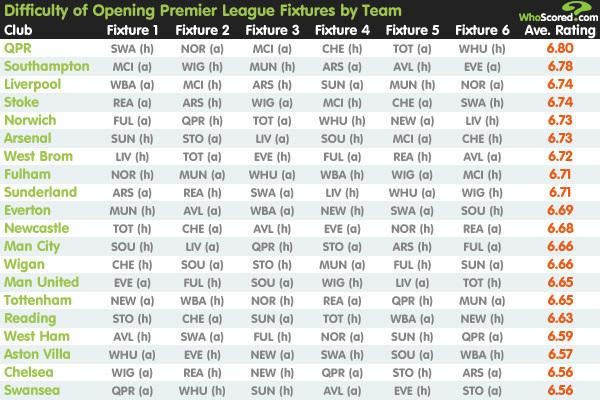 It’s not hard to disagree with the table’s suggestion that Villa have an easy start though… Their next games are: at home to a very solid Everton who just beat Man United; Newcastle away, who were top 5 last season; at home to an increasingly impressive Swansea who won at Villa park last season. For Villa to break their worst run of games in the Premiership without a win, which currently stands at 11 matches, it’s going to take a decent performance. Once the winning feeling returns though,with the style we’re playing and hopefully with a couple of additions to the team, things should start to turn around quickly. At the moment, we’ll have to take the rough with the smooth, and show some patience. Really positive and great way of looking at things. Wish all villa fans were like this!! deanovilla79 It’s just common sense really!